These freestanding Transport Tanks feature horizontal legs and are widely considered the most secure transport tank in the market. With the Pin Mount™ advantage, these tanks are secured with double the number of fasteners than other tanks for similar use. Extra-thick walls provide unmatched strength and durability. 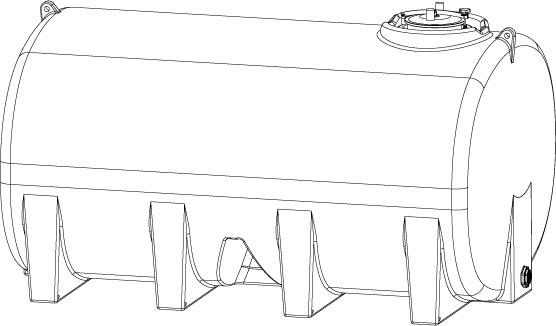 The molded-in mounting lugs combined with heavy-duty steel pins will keep this tank fixed without movement. No hoops. No bands. No maintenance. Lockable and spill-proof, this lid keeps liquid in while traveling on rough terrain. (Only on tanks 1,600 gallons and larger). When cooked and cooled at an even rate, the raw material is bonded together to make this tank virtually indestructible. Rotationally-molded in a single mold means the tank is seamless, water-tight and leak-proof.